This seems like old news now, but every time I look at the pictures, my mommy pride starts oozing out of all my pores. So I had to share. 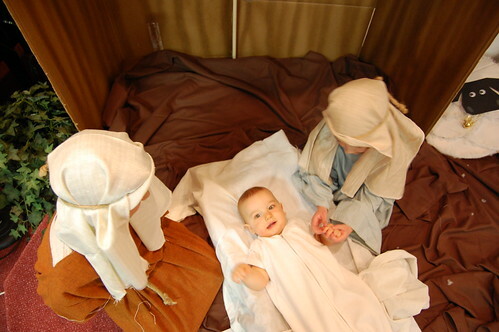 Emma, Mary and Elizabeth had their theatrical debut this December in our church's Christmas play. 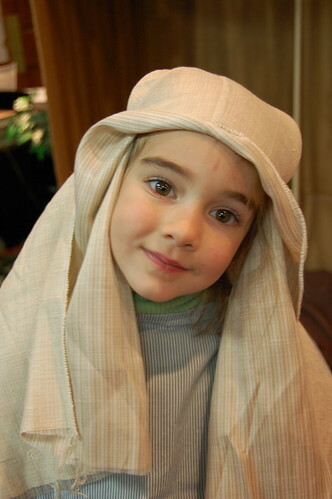 My sweet friend Lori, (thankfully) re-wrote a horribly cheesy play into a classic nativity story. 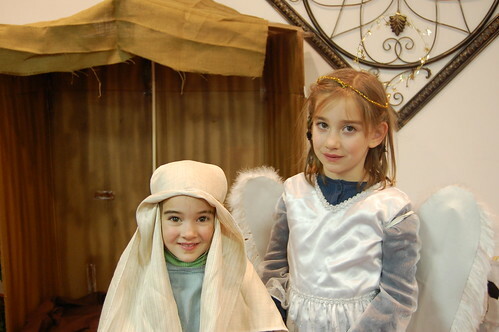 Mary played Mary, Emma was the angel and Elizabeth was the star that the wisemen followed to the stable. Mary had no lines, but was on stage for most of the play, including during her "pregnancy"–a balloon stuffed in her dress, which when Jesus was "born" she pulled out of her shirt and threw on the ground…and it floated and danced across the stage for the remainder of the play. I warned Lori that I didn't think Mary would be able to pull it off. When push came to shove, I thought she'd chicken out. She is so shy and worries so much about people laughing at her (sometimes, this worries me about her, I have to admit), I couldn't imagine her feeling brave enough to go on stage in front of so many people. But after I had a confidence-building talk with her about why people might be laughing, and that they weren't laughing at her, she embraced the role. She pulled it off and is already talking about doing it again next year. Emma was an angel and delivered a mouthful of lines with volume and clarity. She's had her lines memorized since the first evening Lori put the script in her hands. But for her, the evening was more about the wings and the glittery white dress than anything else. And Elizabeth. Dear Elizabeth. She was the star that the wisemen followed to the stable. At the proper cue in the play, Dan was supposed to strap the cardboard star I had made onto her back, strip her down to her little white onesie and send her wandering across the front of the church. Dan got so caught up in the play, he nearly forgot. She made it to the stage, the star thrown over her overalls and red wool sweater at the last minute, just as she turned the corner in front of the audience. And wander she did. Across the front of the stage, up the aisles, onto the stage to pick up Mary's "pregnancy balloon" and check out the baby Jesus, and over to me at the piano. I think she wandered around the church for the rest of the play. We've created a monster and haven't gotten her to sit still in a church service since. I sat behind the piano for all of it to play and sing the carols. I missed most of the play except for a few lines. And Dan sat awestruck in the pews, completely caught up in the moment, with my camera and Flip sitting untouched beside him. Oh well. Some things are better left for our own memories, I suppose. Of course I did maul my children with the camera once the play was over. But Elizabeth had already wandered into the kitchen, tasting each of the Christmas cookies and then throwing them in the trash. More Christmas catch-up coming soon…. 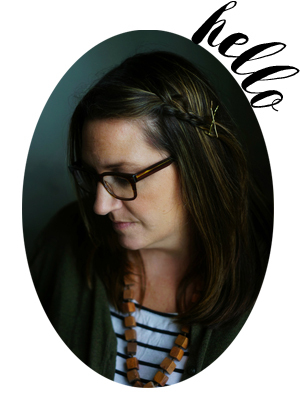 …as well as the news of a new project I'm working on with Emily, and some exciting "newness" here on mommycoddle as well. Oh my goodness. This is such sweetness! And good on you for giving Mary tools to cope with her fears!!! You probably spared her from years of missed opportunities. I can’t wait to hear about the new things you’ve cooked up for the new year. This is so wonderful. Every year my brothers and I would do a little home show for my parents too. What great pictures and what a great moment for your family. It is funny, it seems like we always forget to use the camera for stuff like this. It would have happened that way in our family too! What a wonderful way to celebrate!! reminds me of several years ago when avery played mary and aidan was an angel – until he decided not to be and ran down the aisle to find me. i didn’t even have a camera with me that night. it’s sometimes hard to both live life and capture it. can’t wait to see what you’re up to this year – happy new year molly! We always forget to take pics or video of anything our kids are in. We do have 3 of our girls performing in their first girls choir and only have the last half of their song. Great pictures and yay for your daughter conquering her fears! Just adorable!Its a great story and the girls look just cute as can be! 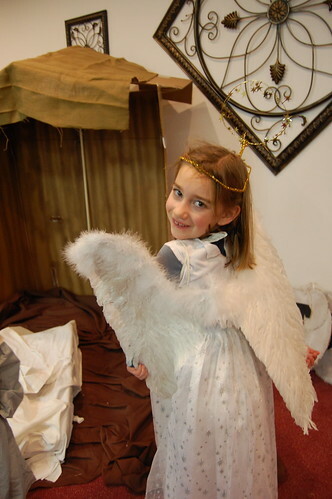 Oh Mary was a precious ‘mary’ and emma made a wonderful angel! I love this! incredible pictures you captured too!